CTS is a course developed by Stanford University. 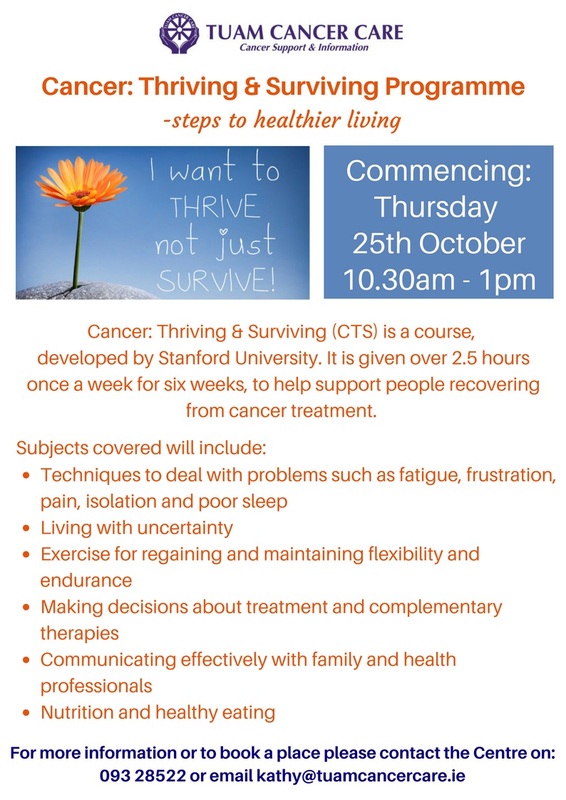 It is given over 2.5 hours once a week for six weeks, to help support people recovering from cancer treatment. Classes are highly participative, where mutual support and success build the participants’ confidence in their ability to manage their health and maintain active fulfilling lives. 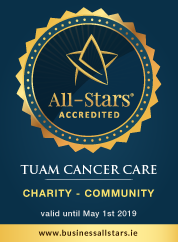 Facilitated by 2 people one or both whom are themselves cancer survivors. Participants make weekly action plans, share experiences and help each other solve problems they encounter in carrying out their self management programme. “The programme taught us how to deal with fatigue and how to better structure our energy and strength. I found the action plan very useful as it helped improve my day to day routine. It increased my confidence and motivation levels .The programme created an awareness of many things I had forgotten about. 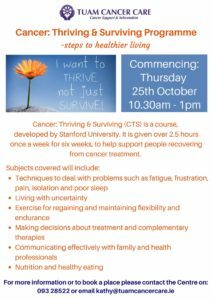 The programme will commence on Thursday 25th October in the centre and will be facilitated by Kathy Kearney & Lucia Canavan. Booking is essential as places are limited.